In the Okangan and Similkameen Valleys, apple clearwing moth has a 2-year life cycle. Adult flight begins in early June, peaks in mid-July and ends in late August. Male emergence peaks about 1 week before the female moths. Females feed on nectar for a few days before laying eggs. The larvea feed on sap between the bark and inner tissue of the trees for up to 2 years before pupation. 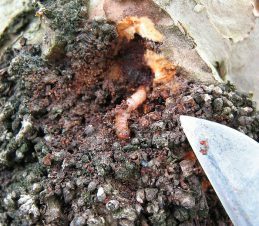 The eggs are laid singly in wounds and crevices in the bark on the trunk and branches of the host tree. The larva can become 15 to 20mm long. They are dirty white in colour with a reddish-brown head. They have a thoracic shield behind their head. 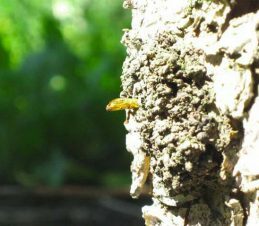 The developing larvae feed on sap and create shallow galleries up to 25 mm long behind the bark. As they feed, reddish brown frass is pushed towards the entry hole where it collects, held together by silken threads. The pupae are pale yellowish-brown and 15mm long. The pupae wriggle to the entrance hole of the gallery. When the moth breaks out of the pupal case they are free to fly away. 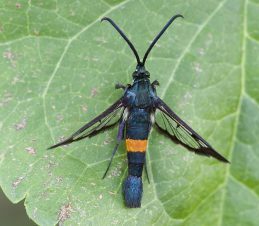 Adult apple clearwing moths have a slender dark blue-black body with an orange band across the abdomen. Their wings are transparent and usually between 20-25mm. The front pair of wings is narrow, shiny and slightly dark in colour. The hind wings are much shorter. The apple clearwing moths can be observed resting on leaves during sunny days. The moths are most active at dusk and dawn. The females lay eggs on the surface of burr knot formations, pruning cuts and wounded bark.